This article is intended to be a general guide to selecting a telescope appropriate for your level of experience as an amateur astronomer. As with any such general guide, there is a lot of overlap between categories and price points within any category. There are suitable beginner telescopes priced from a couple of hundred dollars to a couple of thousand dollars. (All prices mentioned in the course of this article are in 2011 dollars.) Most users can adapt to moving up or down a category without too much trouble. However, an advanced amateur astronomer will likely be frustrated by a beginner's telescope and a beginner might be equally frustrated trying to use an advanced telescope. Your first telescope will not be your last telescope and you should not expect it to be. Do not buy a first telescope expecting it to satisfy your observing needs for the rest of your life. As nice as that would be, it is an unrealistic expectation. Beginner and intermediate telescopes should allow you to see a little bit of everything, but they are unlikely to be optimum for specialized applications. As your skill at using a telescope increases and your ability to use your eyes to really see increases, as well, your telescope needs will evolve. So will your interests, likely in unexpected directions. You may become fascinated with deep space objects, searching for comets, observing planetary details, or solar observing. All of these require more sophisticated types of telescopes and mounts, so your equipment needs will evolve as your experience increases. A good beginner scope should allow you to observe the moon, bright planets and the brightest deep sky objects. Actually, all of the planets in our solar system except Neptune and Pluto, plus the entire Messier catalog of 108 deep space objects (the most popular deep space objects in the night sky) are visible through a modest (60mm clear aperture) beginner telescope operating at no more than 40x magnification, but to get the most pleasure from observing deep space objects, a more sophisticated telescope is desirable. To get the maximum benefit from this article, you must also realistically evaluate your experience level as an amateur astronomer. Everyone is a beginner at some point, but few have the interest, dedication and commitment to become Experts. That's okay, the point of any hobby is to have fun, so progress to whatever level matches your interest and commitment. I, for example, would rate myself as an intermediate level amateur astronomer with maybe an advanced level of knowledge about telescopes and optics. The latter is partly because I spent many years as a professional photographer, where I learned about optics. I was also the Manager of a camera and telescope dealership and I naturally tend to research things that interest me. In addition, I am an equipment junky. The instruments themselves are an enjoyable part of the hobby for me. Level 1 - Beginner: Telescopes suited for beginners are easy to set-up, use and maintain. Very good optical and mechanical quality. A great first telescope that will show you the moon, planets, star clusters and nebulas. Great for families, young people and folks who don't want to mess with equipment, but just want to take a look. Most 60-90mm achromatic refractors and most reflectors up to 115mm will fall into this category, usually on alt-azimuth mounts, but there are exceptions. A 2.4"/60mm clear aperture is the minimum appropriate for any astronomical telescope. Level 2 - Intermediate: Telescopes for the intermediate user are more robust in features and performance. Excellent quality in optics and mechanics, but more complex in use than Level 1 telescopes. They typically take longer to learn and require some set-up or adjustments. An intermediate telescope will allow an enthusiast to "grow" in the hobby. Includes most AZ and EQ mounted achromatic refractors up to 6"/150mm and ED doublet (semi-APO) refractors up to 4.3"/110mm. Most intermediate reflectors have clear apertures up to about 6"/150mm, but a few 8" and 10" models are included. A minimum 3.2"/80mm clear aperture is required. Level 3 - Advanced: Advanced telescopes are high performance, with exceptionaly fine optics and mechanics. They may require a longer set-up time and more skill to master and appreciate. Some advanced telescopes are easy-to-use, but large and heavy. Technically inclined folks will love these scopes. An advanced telescope is a purchase for a lifetime. Typically includes apochromatic triplet refractors from 4"/100mm to 5"/130mm, 4.5"/115mm and larger ED doublet refractors, various 7" to 12" CAT's and 8" or larger Newtonian reflectors. The minimum required clear aperture is 4"/100mm. Level 4 - Expert: Expert telescopes offer uncompromising optical and mechanical quality for the most demanding amateur astronomer. They may be technically involved or designed for specialized use, such as flat field astroimaging or detailed deep sky observation. They carry a premium price, but are designed to provide the ultimate in performance. These are the finest amateur telescopes that money can buy. Required, for our purposes, is a minimum 5.5"/140mm clear aperture. It would be impossible for me to incllude every make and model of telescope available in each class, so what I will do is list representative telescopes of various types (refractor, reflector and catadioptric) in each category. These examples are chosen from the well known Celestron, Meade, Orion, Parks, Questar, Sky-Watcher (Synta), Stellarvue, Takahashi, Tele Vue and Vixen lines. To be sure, there are other, probably equally suitable, brands available. Just because a particular make and model is not included does not mean it is no good. Remember, the telescopes listed below are intended to serve as examples of suitable instruments in each category; this article is not intended to be a comprehensive list of all the telescopes available in each category or even from any one manufacturer. Note that no "department store" telescopes are included. This is because scopes from importers such as Tasco, Jason, Bushnell and department store house brands are rarely satisfactory for any serious astronomical purpose. Nor is any telescope that is marketed of the basis of its theoretical maximum magnification listed, or any telescope not intended for use with at least 1.25" mounting barrel diameter eyepieces. The telescopes that fall into these excluded categories are intended to take advantage of uninformed consumers. This article will, hopefully, help you to become a better informed buyer and avoid such junk. No telescope with a clear aperture of less than 60mm (2.4") is included, because smaller telescopes are so limited in their light grasp that they are unlikely to prove satisfactory. A word about mounting systems. The mounting system is as important as the telescope itself. Even the most sophisticated telescope cannot be used on an inadequate mount that does not hold it steady for focusing and observing. In general, alt-azimuth (AZ) mounts, which move the telescope in straight lines left/right and up/down, are simpler than equatorial (EQ) mounts for entry level telescope buyers to set-up and use. AZ mounts are also natural for terrestrial viewing. Equatorial mounts move the telescope in an arc across the sky, following the apparent motion of the stars and planets as the earth turns. Intermediate, advanced and expert level astronomers use both AZ and EQ mounts of increasing sophistication, depending on their personal preference and equipment requirements. Either type of mount can be motorized and may include a computerized "go-to" system that allows the mount to find objects for the observer. Some people find these computerized mounting systems to be a great advantage and others find them difficult or impossible to master. Go-to mounts, even of the AZ type, must be aligned before use, usually by pointing at known stars in the night sky and recording their locations as reference points for the go-to computer system. Go-to mounts are often recommended to beginners, but a great drawback is that someone who starts with a go-to mount is unlikely to learn the night sky, since they never really learn to locate objects for themselves. Finally, I suggest that you read my article "Telescope Basics," which can be found on the Astronomy and Photography index page, before buying any telescope. If you are not familiar with telescope terminology, and every hobby has its own lexicon, see "Definitions for the Amateur Astronomer," also on the Astronomy and Photography index page. A70Lf w/Portamount courtesy of Vixen Optics. � Celestron Astro Master series - Includes entry level 70mm and 90mm achromatic refractors as well as 76mm, 114mm and 130mm Newtonian reflectors on manual, light duty, alt-azimuth and German equatorial mounts. The Astro Master refractors are designed for both terrestrial and astronomical use. � Celestron NexStar GT series - The NexStar 60 GT achromatic refractor and NexStar 114 GT Newtonian reflector are sold with computerized go-to (motorized) AZ mounts. � Celestron NexStar SLT series - Celestron's more advanced NexStar SLT line, also computerized, includes 60mm, 80mm and 102mm achromatic refractors plus 114mm and 130mm Newtonian reflectors. This line is a step up in quality and price from the NexStar GT series. � Meade ETX Series - 90mm (3.5") aperture f/13.8 and 125mm (5") aperture f/15 Maksutov-Cassegrain optical tubes on plastic swing-through, dual-fork, go-to mounts with included field tripod. Very good optics on truly inferior mounts with a frustrating go-to system. � Orion Observer 70 - This 70mm achromatic refractor is available on a light duty AZ (Observer 70 AZ) or EQ (Observer 70 EQ) mount. � Orion Star Seeker 80 - A 3.2" go-to achromatic refractor on a computerized AZ mount. � Orion StarMax 90mm and 102mm - These are 3.5" and 4" clear aperture Maksutov-Cassegrain telescopes on light duty German equatorial mounts. � Orion SkyQuest XT Classic series - Newtonian reflectors on Dobsonian AZ mounts. Orion recommends the 4.5" and 6" clear aperture models for beginners. � Parks PRT1, PRT2 - 60mm f/12 achromatic refractor telescope with 700mm focal length sold with choice of AZ mounts on wooden tripods. PRT2 mount features slow motion controls. � Parks PRT46 EQ System - 60mm aperture, f/15 achromatic refractor telescope with 900mm focal length. Sold with small equatorial mount featuring RA and Dec. slow motion controls and wooden tripod. � Parks PRT813 - 80mm f/11 achromatic refractor telescope with 900mm focal length. 1.25" focuser. Sold with manual EQ mount featuring slow motion controls and a wooden tripod. � Parks 4.5" f/5 OTA - 4.5", short focal length Newtonian reflector sold only as OTA. Features the same high quality components and craftsmanship used on larger Parks Newtonian telescopes. � Sky-Watcher Refractor BK707AZ2 - 70mm, 700mm focal length, achromatic doublet refractor with 1.25" rack and pinion focuser. Features aluminum main tube with dew shield. Includes 1.25" star diagonal, two 1.25" oculars, 6x24mm finder scope. Supplied with AZ-2 lightweight alt-azimuth mounting system. Recommended by Sky-Watcher for first time buyers. � Sky-Watcher Refractor BK909AZ3 - 90mm, 900mm focal length, achromatic doublet refractor with 1.25" rack and pinion focuser. Features aluminum main tube with dew shield. Includes 1.25" star diagonal, two 1.25" oculars, 6x30mm finder scope. Supplied with AZ-3 alt-azimuth mounting system. Recommended by Sky-Watcher for serious beginners. � Sky-Watcher BK90MAKEQ1 - 90mm clear aperture, 1250mm focal length Maksutov-Cassegrain scope sold as OTA or with lightweight EQ-1 German equatorial mounting system. OTA includes red-dot finder, 1.25" star diagonal and 1.25" eyepiece. Recommended by Sky-Watcher for beginning astronomers. � Sky-Watcher BK102MAKEQ2 - 102mm clear aperture, 1300mm focal length Maksutov-Cassegrain scope sold as OTA or with EQ-2 German equatorial mounting system. OTA includes red-dot finder, 1.25" star diagonal and 1.25" eyepiece. Recommended by Sky-Watcher for beginning astronomers. � Sky-Watcher BKP1145EQ1 - 114mm clear aperture, 500mm focal length Newtonian (parabolic) telescope sold with EQ-1 lightweight German equatorial mounting system. Rolled sheet steel main tube with 1.25" focuser. Includes red-dot finder and two 1.25" eyepieces. Recommended by Sky-Watcher for beginning astronomers. � Sky-Watcher BKP13065EQ2 - 130mm (5.1") clear aperture, 650mm focal length Newtonian (parabolic) telescope sold with EQ-2 German equatorial mounting system. Includes 1.25" focuser, red-dot finder and two 1.25" eyepieces. Recommended by Sky-Watcher for beginning astronomers. � Stellarvue SV70ED and SVR70ED Raptor - 2.75" short tube (f/6) ED doublet (semi-apochromatic) refractors with 2" dual speed Crayford focuser. Excellent optical quality in a small, lightweight package. The Raptor model comes with carbon fiber main tube and dew shield. Sold as optical tube only or with the M1 alt-azimuth mounting system. � Takahashi FS-60C - A 60mm ED doublet (semi-apochromatic) refractor, sold with the Tak "palm size" EQ mount. Suitably compact for airline travel. � Tele Vue-76 - A 76mm (3") ED doublet (semi-apochromatic) refractor. Suitably compact for airline travel. 2" rack and pinion focuser. Very good quality. Recommended for Tele Vue Tele-Pod or Panoramic AZ mounts. � Vixen A70Lf - A 70mm achromatic refractor sold as a package with Vixen's lightweight Porta Mount system or, for $100 more, the beefier Porta II Mount system--a worthwhile upgrade. � Vixen A80Mf - My favorite beginner telescope, a very good 80mm achromatic refractor available as a package with Vixen's solid Porta II Mount system. � Vixen VMC95L with Porta II Mount - This 95mm (3.7") clear aperture modified Cassegrain telescope incorporates a small Maksutov type corrector lens in front of the secondary mirror and is available as a package with the light duty Vixen Porta Mount. � Vixen VMC110L - A 110mm (4.33") clear aperture modified Cassegrain telescope with a small Maksutov type corrector lens ahead of the secondary mirror. Available as a package with the Porta II AZ mount or with the Skypod computerized go-to mount. � Vixen R130Sf with Porta II Mount - A very good entry level 130mm (5") clear aperture Newtonian reflector on a solid AZ mount. Omni XLT150. Illustration courtesy of Celestron. � Celestron NexStar SE series - This is a line of single-fork arm mounted, go-to Schmidt-Cassegrain telescopes; available apertures include 4", 5", 6" and 8", with the 4", 5" and 6" versions solidly in the Intermediate category. � Celestron Omni XLT series - 102mm, 120mm and 150mm achromatic refractors plus a 127mm Schmidt-Cassegrain, 150mm Newtonian reflector and 102mm ED (semi-apochromatic) refractor, all on Celestron's medium-weight CG-4 German equatorial mount. Prices vary, but these are good scopes on a good mounting system. My favorite intermediate telescope line. � Celestron Advanced Series GT computerized telescopes - 6" SCT, 6" achromatic refractor and 6" Newtonian reflector on Celestron's medium weight CG-5 German equatorial go-to mount. Reasonable prices for intermediate scopes on a very solid mount. � Celestron C6 Starbright XLT - 5.9", 1500mm focal length SCT available as an OTA or with the Nexstar go-to fork mount or the CG-5 German equatorial mount. Celestron OTA's come with mounting rail, finder scope and bracket, visual back, star diagonal and 1.25" ocular. A review of this telescope can be found on the Astronomy and Photography index page. � Meade LXD75 Series - 8" SCT; 6", 8" and 10" Schmidt-Newtonian; 5" and 6" achromatic refractors on Meade's medium size LXD75 German equatorial go-to mount with AutoStar system. Also a 6" Newtonian reflector with an inferior plate glass mirror on the same basic mount, but without AutoStar (not recommended). � Orion Sirius 80ED - 80mm refractor with ED doublet objective on Orion's medium-size German EQ mounts (standard or go-to). � Orion AstroView series - 100mm and 120mm short tube achromatic refractors and a 6" (150mm) Newtonian reflector on German equatorial mounts. � Orion SkyView Pro 120 - 120mm achromatic refractor on a medium-size German equatorial mount; also available with a go-to system. � Orion StarMax 127 EQ - 5" Maksutov-Cassegrain scope on a lightweight German equatorial mount. � Orion SkyView Pro 127 and 150 - 5" and 6" Maksutov-Cassegrain CAT telescopes on standard or go-to German equatorial mounts. � Orion SkyQuest XT Classic series - Newtonian reflectors on Dobsonian AZ mounts. Orion recommends the 8" and 10" clear aperture scopes for intermediate users. � Parks 6" f/6 OTA - 6" (152mm), short focal length (910mm), Newtonian reflector available as OTA or bundled with Parks portable pier Astrolight AZ and EQ mounts. Features the same high quality components and craftsmanship used on larger Parks telescopes. � Parks 6" f/8 OTA - 6" (152mm), 1220 mm focal length, Newtonian reflector available only as OTA. Features the same high quality components and craftsmanship used on larger Parks telescopes. � Questar 3.5 Standard - Premium 3.5" Maksutov-Cassegrain scope on a precision machined, swing through, motorized, dual arm, equatorial fork mount with table top legs. Portable piers available in heights for sitting or standing viewing. Also available as optical tube only. Touted as the best personal telescope in the world. � Sky-Watcher Pro 80ED APO - 3.2", 600mm focal length ED doublet refractor with 2" dual-speed Crayford focuser. Features Schott glass crown element and FPL-53 ED element in a baffled, seamless aluminum main tube with dew shield. Sold as optical tube with 2" dielectric star diagonal, two 1.25" oculars, 8x50mm RA finder scope and aluminum carrying case. Includes tube rings and Vixen type mounting rail to fit most mounting systems. Includes tube rings and Vixen type mounting rail to fit most mounting systems. Marketed by Celestron. The same telescope is marketed by Sky-Watcher as the Black Diamond ED100. � Sky-Watcher Refractor BK1021EQ3-2 - 4", 1000mm focal length, achromatic doublet refractor with 2" rack and pinion focuser. Features aluminum main tube with dew shield. Includes 2" star diagonal, two 1.25" oculars, 6x30mm finder scope. Supplied with EQ-3 German EQ mounting system. � Sky-Watcher Pro 100ED APO - 4", 900mm focal length ED doublet refractor with 2" dual-speed Crayford focuser. Features Schott glass crown element and FPL-53 ED element in a baffled, seamless aluminum main tube with dew shield. Sold as optical tube with 2" dielectric star diagonal, two 1.25" oculars, 8x50mm RA finder scope and aluminum carrying case. Includes tube rings and Vixen type mounting rail to fit most mounting systems. Marketed by Celestron. The same telescope is marketed by Sky-Watcher as the Black Diamond ED100. � Sky-Watcher Equinox 100 OTA - Deluxe 4", 900mm focal length ED doublet refractor. Features a deluxe seamless aluminum main tube with 2", Dual-Speed, machined Crayford focuser that is 360-degree adjustable. Graduated scale on drawtube for fast and precise focusing with CCD or DSLR cameras. Includes integral Vixen finder shoe, retractable dew shield, tube rings and Vixen type mounting rail to fit most mounting systems. Sold as optical tube only with an aluminum carrying case. Optical system is identical to Black Diamond ED100. � Sky-Watcher Refractor BK1201EQ5 - 4.7", 1000mm focal length, achromatic doublet refractor with 2" rack and pinion focuser. Features aluminum main tube with dew shield. Includes 2" star diagonal, two 1.25" oculars, 9x50mm finder scope. Supplied with EQ-5 German EQ mounting system. � Sky-Watcher BK127MAKNEQ3 - 127mm (5") clear aperture, 1500mm focal length Maksutov-Cassegrain scope with 2" visual back. Sold as OTA or with EQ-3 German equatorial mounting system. OTA includes red-dot finder, star diagonal and two eyepiece. Recommended by Sky-Watcher for deep sky observing. � Sky-Watcher BKP15075NEQ3 - 150mm (5.9") clear aperture, 750mm focal length Newtonian telescope sold with EQ-3 German equatorial mounting system. Includes 1.25" focuser, 6x30 finder and two 1.25" eyepieces. � Sky-Watcher Refractor BK15012EQ6 - 5.9", 1200mm focal length, achromatic doublet refractor with 2" rack and pinion focuser. Features aluminum main tube with dew shield. Includes 2" star diagonal, two 1.25" oculars, 9x50mm finder scope. Supplied with EQ-6 German EQ mounting system. � Sky-Watcher Signature Series BK150MAKSP - "Professional quality" 150mm (5.9") clear aperture, 1800mm focal length Maksutov-Cassegrain scope with 1.25" visual back. Sold as OTA with Vixen type mounting rail. Includes 9x50mm finder, 1.25" star diagonal and two eyepieces. � Stellarvue SV80ED, SVR80ED Raptor - 3.2", 560mm focal length ED doublet (semi-apochromatic) refractors with 2" dual-speed Crayford focuser. SVR80ED Raptor features a carbon fiber main tube and dew shield. Sold as optical tube only or with the M1 or M2 alt-azimuth mounting systems. Also available with Celestron German equatorial go-to mounts. � Stellarvue SV102ED - 4" ED doublet refractor with dual speed Crayford focuser. Sold as optical tube only or packaged with the M2 alt-azimuth mounting system. Also available with Celestron CG-5 or CGEM computerized German equatorial mounts. A review of this telescope can be found on the Astronomy and Photography index page. 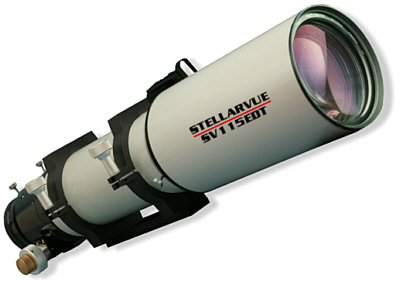 � Stellarvue SV110ED-BV- 4.3" ED doublet refractor with dual speed Crayford focuser. Sold as optical tube only or packaged with the M2 alt-azimuth mounting system. Also available with Celestron CG-5 or CGEM computerized German equatorial mounts. � Takahashi FCL-90 (Sky 90) - A 90mm (3.5") ED doublet refractor, sold as an optical tube with 2" focuser and finder scope, that is suitable for medium size mounting systems and compact enough (504mm focal length) for airline travel. � Tele Vue-85 - An 85mm (3") ED doublet (semi-apochromatic) refractor. 600mm focal length. Suitably compact for airline travel. 2" rack and pinion focuser. Very good quality. Recommended for Tele Vue Panoramic or Gibralter AZ mounts. � Tele Vue-102 - A 102mm (4") ED doublet (semi-apochromatic) refractor. 880mm focal length. 2" rack and pinion focuser. Very good quality. Recommended for Tele Vue Gibralter AZ mount. � Vixen ED80Sf - A 3.2" ED doublet refractor that is suitable for Vixen's Porta II AZ mount or the German equatorial GP2 and Sphinx (go-to) mounting systems. � Vixen ED81S - 3.2" ED doublet refractor with dual speed rack-and-pinion focuser that is available packaged with Vixen's Porta II AZ mount or the German equatorial GP2, GDP2 and Sphinx SXW (go-to) mounting systems. � Vixen ED100Sf - A 4" ED doublet refractor that is suitable for the Porta II AZ mount, German equatorial GP2 and Sphinx (go-to) mounting systems. 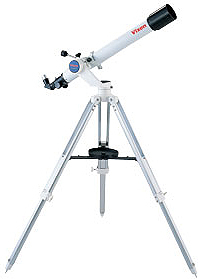 � Vixen ED103S - A 4" ED doublet refractor with dual speed rack-and-pinion focuser. Available packaged with the Porta II AZ mount, GP2 German equatorial mount, heavy duty GDP2 German equatorial mount or the Sphinx SXW and SXD go-to EQ mounts. � Vixen R130Sf with GP2 Mount - The R130Sf (5") Newtonian reflector on Vixen's medium-size GP2 German Equatorial mounting system. � Vixen R150S - A 6" Newtonian with either the medium-size GP2 or Sphinx (go-to) German Equatorial mounting systems. SV115EDT refractor. Illustration courtesy of Stellarvue. � Celestron Advanced Series GT computerized telescopes - 8", 9.25" and 11" SCT's; 8" and 10" Newtonian reflectors on Celestron's medium weight CG-5 German equatorial go-to mount. Reasonable prices for advanced scopes on a good mount, although the CG-5 is actually about optimum for the C8 SCT optical tube (54.5 lbs. total system weight). � Celestron C8 Starbright XLT - 8", 2032mm focal length SCT available as an OTA, with Nexstar or CPC go-to fork mounts, or Celestron CG-5 and CGEM German equatorial mounts. OTA's come with mounting rail, finder scope and bracket, visual back, star diagonal and 1.25" ocular. A review of this telescope can be found on the Astronomy and Photography index page. � Celestron C9 Starbright XLT - 9-1/4", 2350mm focal length SCT available as an OTA, with CPC go-to fork mount or Celestron CG-5, CGEM and CGE Pro German equatorial mounts. OTA's come with mounting rail, finder scope and bracket, visual back, star diagonal and 1.25" ocular. � Celestron C11 Starbright XLT - 11", 2800mm focal length SCT available as an OTA, with CPC fork mount, or the CG-5, CGEM and CGE Pro German equatorial mounts. Celestron OTA's come with mounting rail, finder scope and bracket, visual back, star diagonal and 1.25" ocular. Assembled in USA. � Meade Series 5000 ED APO Refractors - 102mm (4") aperture 700mm focal length and 127mm (5") aperture 952.5mm focal length ED triplet refractors sold as OTA's only. Feature 2" dual-speed Crayford focusers; supplied with 2" star diagonals. � Meade LX-90 Series - 8", 10" and 12" aperture f/10 SCT's on swing-through, dual-fork, go-to mounts with included tripod. ACF (advanced coma-free) versions of these telescopes are available at extra cost. � Orion SkyView Pro 180 - 7" Maksutov-Cassegrain CAT telescope on standard or go-to German equatorial mount. � Orion SkyView Pro 8 - An 8" Newtonian reflector on standard or go-to German equatorial mounts. � Orion Sirius series - 120mm ED doublet refractor on Orion's medium-size German EQ mounts (standard or go-to), 180mm (7") Maksutov-Cassegrain on a go-to EQ mount and an 8" Newtonian reflector on a go-to EQ mount. � Orion Atlas 10 EQ-G - As the nomenclature suggests, a 10" Newtonian reflector on a heavy German equatorial go-to mount. Not for weaklings or people with bad backs! � Orion SkyQuest XX12i and XX14i - These are 12" and 14" truss tube Newtonian reflectors on computerized go-to Dobsonian AZ mounts. Lots of light grasp for the dollar, but a hassle to set-up and collimate. Not for those who are impatient to start observing. � Parks 8" f/6 OTA - 8" (200mm), 1220mm focal length, Newtonian reflector available as OTA or bundled with Parks portable pier Astrolight AZ and Superior System EQ mounts. Features the same high quality components and craftsmanship used on larger Parks telescopes. � Parks 10" f/5 OTA - 10" (250mm), 1270mm focal length, Newtonian reflector available as OTA or bundled with Parks Superior System EQ portable pier mount. Very good quality components and craftsmanship. � Sky-Watcher Pro 120ED APO - 4.7", 900mm focal length ED doublet refractor with 2" dual-speed Crayford focuser. Features Schott glass crown element and FPL-53 ED element in a baffled, seamless aluminum main tube with dew shield. Sold as optical tube with 2" dielectric star diagonal, two 1.25" oculars, 8x50mm RA finder scope and aluminum carrying case. Includes tube rings and Vixen type mounting rail to fit most mounting systems. Includes tube rings and Vixen type mounting rail to fit most mounting systems. Marketed by Celestron. The same telescope is marketed by Sky-Watcher as the Black Diamond ED120. � Sky-Watcher Equinox 120 OTA - Deluxe 4.7", 900mm focal length ED doublet refractor. Features a deluxe seamless aluminum main tube with 2", Dual-Speed, machined Crayford focuser that is 360-degree adjustable. Graduated scale on drawtube for fast and precise focusing with CCD or DSLR cameras. Includes integral Vixen finder shoe, retractable dew shield, tube rings and Vixen type mounting rail to fit most mounting systems. Sold as optical tube only with an aluminum carrying case. Optical system is identical to Black Diamond ED120. � Sky-Watcher Signature Series BK180MAKSP - "Professional quality" 180mm (7") clear aperture, 2700mm focal length Maksutov-Cassegrain scope with 1.25" visual back. Sold as OTA with Vixen type mounting rail. Includes 9x50mm finder, 1.25" star diagonal and two eyepieces. � Sky-Watcher BKP2001HEQ5 - 200mm (8") clear aperture, 1000mm focal length Newtonian telescope sold with motorized EQ-5 German equatorial mounting system. Includes 2" focuser, 9x50 finder and two 1.25" eyepieces. � Sky-Watcher BKP25012EQ6 - 254mm (10") clear aperture, 1200mm focal length Newtonian telescope sold with motorized EQ-6 German equatorial mounting system. Includes 2" focuser, 9x50 finder and two 1.25" eyepieces. � Stellarvue SV105 and SVR105R Raptor - Premium 4" APO refractors with triplet objective lens using Ohara FPL-53 ED center elementand 3" Feather Touch dual speed focuser. SVR105R Raptor comes with carbon fiber main tube. Can be packaged with M2 or M7 alt-azimuth mounts or Celestron CG-5 or CGEM German EQ mounts. A review of the SV105R can be found on the Astronomy and Photography index page. � Stellarvue SV115EDT - 4.5" APO triplet refractor with Ohara FPL-51 ED center element and 3" dual speed Crayford focuser. Sold as optical tube only or packaged with the MG alt-azimuth mounting system. Also available with Celestron CGEM computerized German equatorial mount. � Stellarvue SV115T - Premium 115mm (4.5") APO triplet refractor with Ohara FPL-53 ED center element and Feather Touch dual speed focuser. Can be packaged with Stellarvue M2 or M7 alt-azimuth mounts; alternatively with Celestron CG-5 or CGEM computerized EQ mounts. A review of this telescope can be found on the Astronomy and Photography index page. � Stellarvue SV130EDT - 5" APO triplet refractor with Ohara FPL-51 ED center element and 3" dual speed Crayford focuser or optional 3" Feather Touch dual speed focuser. Can be packaged with Celestron CGEM computerized EQ mount. � Takahashi TSA 102 - Premium 102mm (816mm FL) triplet apochromat refractor, sold as optical tube only or as a set with accessories and Tak German EQ mount. � Takahashi TSA 120 - Premium 120mm (900mm FL) triplet apochromat refractor, sold as optical tube only or as a set with accessories and Tak German EQ mount. � Tele Vue NP-101 - A short focal length (540mm, f/5.4), 101mm (4"), Nagler-Petzval APO refractor. 2" rack and pinion focuser. Recommended for Tele Vue Gibralter AZ mount. � Tele Vue NP-127is - A short focal length (560mm, f/5.2), 127mm (5"), Nagler-Petzval APO refractor designed primarily for flat field imaging, but also very good for viewing. Focusmate 2.4", dual speed, rack and pinion focuser. Recommended for Tele Vue Gibralter AZ mount, but requires special mount head. � Vixen AX103S - Premium Apochromatic 4" refractor with an ED triplet objective and a rear field corrector lens. Available packaged with the entire series of Vixen German equatorial mounts. � Vixen ED115S - A 4.5" ED doublet refractor with dual speed rack-and-pinion focuser. Available packaged with the GDP2 German equatorial mount, go-to Sphinx SXW or Sphinx SXD EQ mounts. � Vixen VMC2000L - A 2000mm (8") clear aperture catadioptric scope with an open tube design. The meniscus corrector lens is placed just in front of the secondary mirror. Available packaged with the German equatorial GP2 or GDP2 mounts or the computerized go-to Sphinx mounts. � Vixen R200SS - A very bright 8", f/4 Newtonian reflector packaged with your choice of GP2, GDP2, Sphinx SXW (go-to) and Sphinx SXD (go-to) equatorial mounts. CGE Pro 1100HD. Illustration courtesy of Celestron. � Celestron Edge HD series - Premium 8", 9.25" 11" and 14" aplanatic Schmidt-Cassegrain telescopes sold as OTA's or with Celestron's CGEM or CGE Pro German equatorial mounts. The Edge HD optical tubes are designed for flat-field CCD imaging and visual use and produce diffraction limited stars across the entire field of view. Incorporates Schott glass sub-aperture corrector/field flattener in central baffle, mirror locks, filtered cooling vents and removable secondaries for f/2.0 Fastar CCD imaging. These are Celestron's finest telescopes and probably the world's best SCT's. Asembled in USA. � Celestron C14 Starbright XLT - 14", 3910mm focal length SCT available as an OTA or with a heavy-duty CGEM or CGE Pro German Equatorial mounts. Celestron OTA's come with mounting rail, finder scope and bracket, visual back, star diagonal and ocular. Assembled in USA. � Meade MAX - 20" aperture, 4064mm focal length, f/8, LX400-ACF Modified SCT on massive MAX robotic German EQ mount. Mount is made in USA and weighs 329 pounds without a pair of 35 pound counterweights (included). Telescope features carbon fiber main tube and weighs 190 pounds; requires five 35 pound counterweights (included). MAX scope and mount retail for approximately $65,000 together; also available separately. � Parks 12.5" f/5 OTA - 12.5" (317.5mm), 1588mm focal length, Newtonian reflector available as OTA or bundled with Parks Superior System (125 pound) or Observatory System (375 pound!) EQ pier mounts. Very good quality components and craftsmanship. � Parks 16" f/5 OTA - 16" (406mm), 2032mm focal length, Newtonian reflector available as OTA or bundled with Parks Observatory System (375 pound!) EQ pier mount. Very good quality components and craftsmanship. � Questar 7 Astro - Premium 7" clear aperture, 2400mm focal length, Maksutov-Cassegrain scope. OTA incorporates many special features, weighs about 20 lbs. Sold as optical tube assembly (mounts to 1/4x20 or 3/8x16 tripod heads) or with a precision machined, swing through, dual arm, equatorial fork mount with worm driven sidereal clock, synchronous DC drive. Portable and fixed piers available. The hot set-up is the 7 Astro in the swing through fork mount on the Questar Large Astro Pier. Lots of accessories and upgrades available; bring your platinum card! Made in USA. � Stellarvue SV160 - Premium 160mm (6.3") APO triplet refractor with Ohara FPL-53 ED center element and 3.5" Feather Touch dual speed focuser. Can be packaged with Celestron CGE Pro computerized EQ mount or Mountain Instruments MI-250 EQ pier mount. Assembled in USA. � Takahashi M Series - The Mewlon Series of Dall-Kirkham (Cassegrain) Telescopes with 210mm (2415mm FL), 250mm (3000mm FL) and 300mm (3572mm FL) models. Sold as OTA's or sets with Tak German EQ mounts incorporating polar axis alignment finder scopes. Made in Japan. � Vixen NA140SSf - 5.5" Neo-Achromatic refractor with an ED doublet objective and a Petzval design doublet at the rear of the optical tube. Available packaged with the GDP2 German equatorial mount, either Sphinx go-to mount or the Atlux go-to mount. Made in Japan. � Vixen VC200L - 8" modified Cassegrain with VISAC (Vixen's Six-Order Aspherical Cassegrain) aberration correction for the most discerning observer and astrophotographer. Open tube design with fixed, aspherical primary mirror and triplet corrector lens in central baffle tube. 2" Crayford focuser behind rear cell does not move primary mirror; dual speed focuser optional. Available packaged with the GDP2 or either of the Sphinx go-to German equatorial mounts. Perhaps the ultimate 8" CAT. A review of the VC200L can be found on the Astronomy and Photography index page. Made in Japan. � Vixen VMC260L - A 260mm (10.2") clear aperture, f/11.5 modified Cassegrain telescope with 2" focuser and open tube design. Available as an OTA or packaged with Vixen's heavy-duty Sphinx SXW go-to mounting system. The VMC260L telescope is also available with Vixen's even larger Atlux go-to German equatorial mount/tripod. Made in Japan. � Vixen VMC330L - This is Vixen's biggest scope, a 13", f/13 modified Cassegrain with dielectric coated mirrors, two corrector lenses located in front of the secondary mirror and an open tube design. Available as an OTA ($14,999) or with a Gaiax pier mount. If you fly to Saipan and stay at the Palms Resort, you can borrow one for an evening. Made in Japan.